Looking to but some near earplugs/earbuds. Anyone know of more detector friendly models. Been using hi end music types. Does the trick but not very durable. My anglo skin burns up quickly in this sun--even with buckets of SPF110 on--- so I like to use ear plugs and keep my Tilly hat on. Your question is a little confusing. You say earplugs, but then you say ear buds? I have tried skullcandy earbuds, and I hated them due to all the noise from the breeze, and I could hear the wires moving and stuff. I use the Dollar store ones most of the time. Keep about 6 pairs in the van. $1.00 a pair, Works for me. I'm open to either. 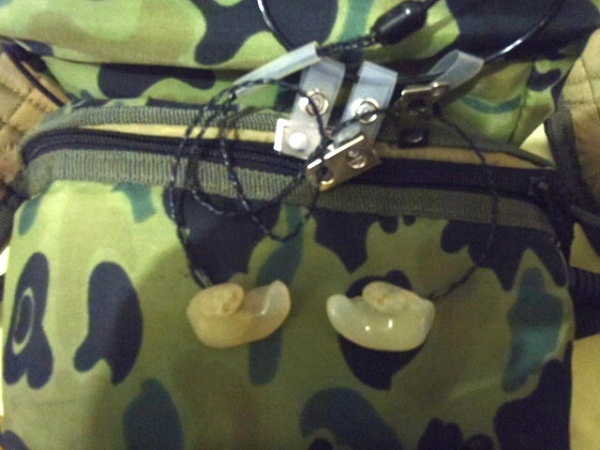 I've used up my old "studio" guitar earplugs---form fitted to ear but too expensive to bring down several pairs. Searching on line I've seen several "sport" earbuds, some over the ear "earphones". Advances in that kind of stuff are usually a couple years ahead in the states and as prospectors go they usually work out the best stuff sone after. HF-- that's my default position. Gone thru the batch I've brought down. Yea, Can't wear over the ear stuff here. You have to know what's going on around you down here. Just a tip for in the ear users……. Earbuds are a good way to get an ear infection with all the dirt and dust associated with tecting. Be sure to keep them clean and your ears also. Alcohol in the Ear Hole? Eaaaaaaaaaaaaaaaaa! What Ya Say? So, no more cutting up raw chicken for the BB-Q and heading off detecting? Koss makes a nice set which are connected together by a plastic moulded piece that wraps around the back of yer neck. Good sound , doesn't interfere with a hat and stay in place. Last time I bought a pair at Radio Shack about 10 bucks. Interests:I Will Just follow you with My E-trac, Sov GT, GP 3500 or Gold Bug Pro . I use JVC ear buds . They seem to have the best tones . I have a set of BOSE IE2 in ear plugs and love them for summer use. Still prefer over ear style so I can get in the "zone" I can't fully concentrate with the noise of wind, scrubbing coil, birds, etc. distracting me while hunting. An old New England remedy for cleaning ears is warm glycerine dropped into the ears with an eye dropper ... it melts the wax ... after 15 minutes or so flush with warm water from a large rubber syringe ... CAREFUL though don't squirt it too hard as you could do more damage than good to your hearing. You need just enough pressure to flush the ear ... you're not power washing the vinyl siding on your house! To be a bit gross ... if you want to see how much wax really comes out flush over a large collection bowl (the wide's bread mixing bowl ... just don't tell her what you are using it for) or into your sink with the stopper in place in the drain. If you are anything like my earwax production you will wonder how you ever heard anything through all that wax! just tipped my head over and let run out never bothered my hearing at all,maybe I have blond ear drums 63 years later. stuff to use for sure.. You only have 2 so take care of them while you can..
Don ... Just remember that is just pharmaseutical grade glycerine ... It ain't 'nitro' glycerine ... you're only trying to clean the ear not blow a bigger hole in your head! THAT WAS ME, I'VE USED GLYCERIN FOR YEARS TO TREAT RUBBER AND SIMILAR MATERIALS. THE ONE YOU BUY OFF THE SHELF AT THE DRUG STORE IS ACTUALLY A SKIN TREATMENT. LIKE THE LOTIONS MOST PEOPLE BUY TO TREAT DRY CHAPPED AND ROUGH HANDS. A friend of mine once said he used a mixture of rubbing alcohol and vinager. Would put a few drops in each ear. After as much research as possible on the net.. I'm going to pick up a pair of Telex HFY-91---they seem to be very popular in Oz. Being a "under the chin--behind the neck" should solve the problem of wind/cord noise. I'm guessing with the foam ear-pads that should help with the wind also. The 1/4 jack is nice also. I have to post a field test after i get back. Hi Guys I live in the desert and headphones get to hot and I really don't like the clamping pressure. I tried many diff. ear buds with crappy sound, and then came across these. 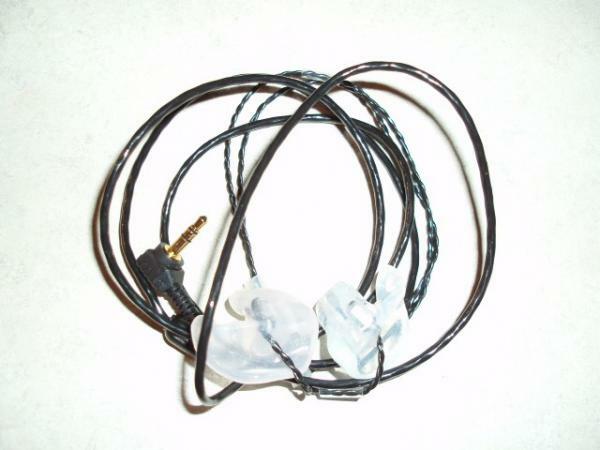 They are made for voice so they don't have any bass, they are crystal clear for MDing, under chin so no problem wearing a hat. Very comfortable. The best part they cost about 25 bucks. 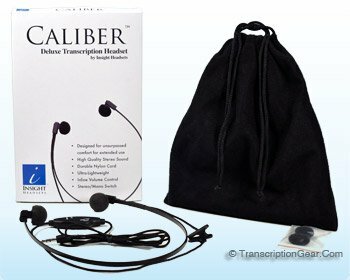 Caliber transcription headset by Insight Headsets features crystal clear audio and inline volume control with stereo/mono switch. Completely redesigned, it is ultra lightweight, less than one ounce and comes complete with a 5' cord and 5' cord extender. Here is there link::: You can find them on Amazon...all so.